Jeff Kaplan is a man that wears many hats: He's director of Overwatch--Blizzard's acclaimed multiplayer shooter--a peanut butter enthusiast, and a beloved meme. Naturally, he's got plenty of wisdom and insight to offer on each of these subjects, and more. During a recent visit to London, we caught up with him and talked about everything from the continuously re-balancing Overwatch and the possibility of introducing a map editor, to his YouTube stardom and beard woes. On a scale of 1-10, how stressed does having to make tweaks to Overwatch make you? It doesn't make me stressed at all. If one is the lowest end, I'd say one. It's one of the greatest things that we get to do. We feel really fortunate that we get to work on this game and we absolutely love it. All of us as players say to ourselves, "This is working really well" or "This could be a little bit better, I wish we could go in and do something about it." And we literally can do that. We feel very lucky to be part of that. It must feel like pulling Jenga blocks out of a stacked tower though. Doesn't that stress you out? We just need to be really careful. I think when we read feedback and hear players comment about the balance that they'd like to see, most players either main one or two heroes, or they gravitate towards a certain role. When they tend to talk about imbalance in other heroes, they just want to make them go away. Like if you play a lot of Mercy, and Genji is harassing you, the feedback we tend to get is like, "Remove all critical chance and he should only fire one shuriken instead of three, and...", it's all these sledgehammer approaches. The trick for us is trying to approach the balance in a way where we say, "We've got these 24 heroes and there's a main out there for each player. We have to represent all those people, to make sure that they're all fun to play and play against; that nothing dominates the balance. So that part of it is what's tricky. It's easy to nerf or buff a hero but you don't want to create a situation where you just literally define whether or not that hero is always played in every single match or never played. We like to take it a little more slowly than I think the players would like us to. What kind of shampoo do you use? Because your hair always looks great in the developer updates. [Laughs] Oh, awesome! I don't even know the name of it! It's whatever my wife puts in the shower. I'm so terrible. Do you have an upper limit for how many heroes you want in the game? At some point balancing is going to become an impossible task, right? I don't have a number in my head. It's funny because when we first came up with the game concept we had a really huge number in mind. And then we kept shrinking that number and now we're more evaluating things almost like an evolving process. Each hero that comes out makes us evaluate how much time it should take for the next hero to come out. I really do feel that we should not be in a mode where we're shooting to have one hero a month or something like that. MoBAs need to do that because of the type of gameplay they have and the business model. I think we need to take a step back from hero development in Overwatch and really evaluate what it does to the meta--but also there's some other factors. One of the factors is our time and attention. The more heroes we add, the less attention we're giving to the existing 24 heroes that are already out there. Then also I think there's something that's really valuable in player affinity for a hero. That has to do with how the hero looks, the backstory, their relationships with other heroes in the game, and I feel like the more heroes we add the less we can invest in each hero that already exists. So, I would like to see hero development not go any faster than it currently is and maybe over time even slow down somewhat. I want each hero to feel like a really special event where you're just so excited, they fit in, and once they're added, it feels like they were always meant to be there. [I don't want] to get into a mode where we're like, "What's the hero of the week" and they start to homogenize with each other or take away from each other. Can you patch out Genji? [Laughs] We can! Now the question is, "Should we patch out Genji?" I think we had some problems with Genji when the game was released. He was really challenging for people to deal with. I think Genji has increasingly become easier for people to deal with and we've made some balance changes. We're also seeing Winston become more prevalent in the meta and Winston gives Genji a whole lot of trouble. I think the community has really good instincts at this point. I feel like one of the things that we're fortunate to enjoy with Overwatch is a shared vision with the community about how the game should play and what the meta should feel like at any given point. In that regard I actually feel like we're pretty aligned. Usually when they start to boil up about something we're feeling something similar internally. I do think there are some parts of the community that has unrealistic expectations about how the metagame should work. For example, there's some people that feel like every hero should be picked equally all the time, and I'm just not sure in the day and age of information that we live in, and communal discussions about games and strategies, that's ever a realistic situation. Let's say every single hero was equally balanced against each other, I think there's sort of a groupthink to the community that's going to follow certain trends at different times anyway. I don't think it's terrible for there sometimes to be situationally picked heroes in certain settings. One of the reasons that we've been very vocal, I almost want to say aggressive about … I don't want to say "forcing" but "highly encouraging" the map pool to always stay large--we haven't reduced the map pool in competitive play--is because the map variety directly influences the hero variety. There are areas like the streets of King's Row where Reaper is suddenly really viable for certain reasons. Or you get to the backlot in Hollywood and now Widowmaker and Pharah are coming into play in ways that they weren't before. I think that's okay in the balance; if we have enough variance in the maps the heroes will sort of ebb and flow. It's funny because, and I won't mention which hero because it would anger people, but there was a hero that we nerfed recently and fans of that hero are very vocal. They point to the pick percentages in the pro scene, which is a very unrealistic way to look at the entire game because it only represents a very small percentage, and their hero used to be picked 60 percent of the time and now it's down to 40 percent. They were up in arms saying, "Look at that, we're down to 40 percent." I never said this, but I kind of wanted to hint at, really if everything was equally balanced your hero would be picked less than five percent of the time so, let's not make up these weird rules for ourselves about how balance should work. How come Symmetra doesn't have to aim but everyone else does? Seems a bit unfair. That was very deliberate! When we were designing the game we wanted it to be very approachable. And approachability came in a lot of different ways: it's a bright, beautiful world, there are heroes from all walks of life that represent all these different fantasies that we all wanted to be part of, and another one was making sure to have a good mix of tactical and strategic heroes. All heroes have some amount of strategy and tactics to them but we didn't want the only people who came to Overwatch and have success to be these people that are great at putting crosshairs over something at 50 meters out and hit it every time. We wanted a variety in the gameplay. As much as Symmetra doesn't need to aim when someone is in close on her, she's about territory control. Usually most players know that if they got in that range of Symmetra, more often than not, it was their fault. You know what her thing is, so stay out of her range. And she has to aim those big, slow moving balls. I understand that, but I hate her with the fire of a thousand suns. [Laughs] Yeah, she can be tricky. The worst is when you're Reinhardt and you walk in on the turrets and you're swinging your hammer and yelling at your team, "Can SOMEONE shoot these turrets for me?!" I'm like Winston in that if I had one food that I had to survive off of for the rest of my life, it'd be peanut butter. I don't get frustrated or worried. I feel very lucky and fortunate that they're so into the game. They have such a passion for it and I've never seen a community with this much passion. I've never seen a community own a game themselves as much as the Overwatch community. The game belongs to them and I've said this before but at this point Blizzard is just custodians of the experience. We just deliver what they want. It's a lot of pressure knowing how much they want and the rate at which they want it. But it's also really exciting. I spent six and a half years working on World of Warcraft and I loved being engaged with that community, seeing how passionate they were, learning the things they wanted. Then I had a good five years where I was working on internal development on unreleased projects and, you don't realise it at the time since you're working on a live game, thinking about how much pressure it is, wishing you could make the forum go away for a week so you can mentally have a break, but once that's gone, when you're in a period where you don't have an audience to feed off of, it gives you time to reflect on how valuable and how much a part of game making the people who play it really are. I think we're very lucky that we get to riff of them and feed off their energy. We actually change what we're doing … we'll hear about something they want and we'll change like, "They seem really excited about this direction maybe we'll pull the game this way." I feel lucky. Does Winston like crunchy or smooth peanut butter? I think he likes both. I think if left to his own devices it's smooth, but he wouldn't turn down crunchy either. Does Jeff Kaplan like crunchy or smooth peanut butter? I like smooth for sure. And I love peanut butter. I'm like Winston in that if I had one food that I had to survive off of for the rest of my life, it'd be peanut butter. Same. I once purchased 10 kilograms of peanut butter just because it was on discount. Have you thought about introducing a proper story-driven campaign or are you content with the little morsels of narrative you're peppering in? We've been talking about this topic a lot lately. We've had so much fun doing the animated shorts and we have some cool surprises in store for people in that direction. It's probably one of our favourite things to do. I feel like in some ways we can do better storytelling in those than we could through gameplay. I'm very excited because we have a new comic coming out very soon. I think it's our best comic to date and it tells more about Overwatch than any of our comics have in the past. I'm very excited for our players to get their hands on that. One of the most interesting things for us was the Junkenstein event that we made for Halloween. We had never made any player versus environment content. The game is very deliberately designed to be this player versus player experience, but a lot of us on the Overwatch team come from either the StarCraft team or World of Warcraft. The guys who sit in my room love making that kind of content and Junkenstein was a really good experiment for us to go, "What could PvE feel like?" in not only how it played but how we delivered story. We narrated Junkenstein, we used Reinhardt, made a comic about it, the chatter between the four heroes … I think it's something we'd like to experiment with. For a 6v6 PvP game coming out with a whole single-player campaign is like making a brand new game in and of itself. I'm not sure our players understand the magnitude of development that would go behind that. But certainly it's a fascinating idea. They say you shouldn't have a favourite son but who is your favourite Shimada brother and why? Oh, Hanzo for sure! I think Genji is the one on the positive side. He's the one who is a little bit broken and is more fixed. He's found his inner peace. But Hanzo is a very broken individual. I sympathise greatly with him and I also think his gameplay is really fun. I can't play Genji to save my life. Like, Genji comes up to me and does the combo, deflects, wall climbs, and is out. I play Genji, jump in there, do the deflect, and someone shoots me in the head and it's like, "What are you doing you fool?" But I like playing Hanzo and I can play him okay. 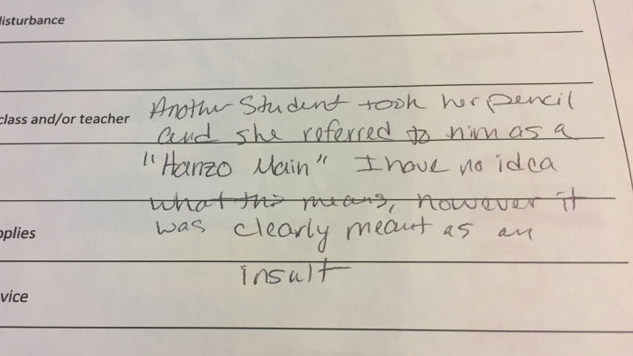 Did you hear the story about the girl who called another kid a "Hanzo Main"? Do you endorse calling people a "Hanzo Main" as a way to dunk on them? Not as a derogatory way. We need to love and respect all mains, including Hanzo mains [Laughs]. It's a funny story, we actually reached out to the girl and her family, we sent them a note. The parents sent back this lovely letter to us and said, "We appreciate it so much that you guys reached out. We've been talking to our daughter about not making fun of somebody for maining a certain hero." I think the whole community learned a little lesson in there. Have you ever considered introducing a pick and ban system, similar to MoBAs like DotA to push people into making more appropriate picks for each match? We've talked about it. So, there's two types of pick and ban systems, one that relates to maps and one that relates to heroes. I'm not a fan of either. I think they work very well for a MoBA where you don't have hero switching. I think the problem with Overwatch as it pertains to pick and ban systems is that the game was designed to have a certain level of fluidity to it. I think that fluidity would go away [with a pick and ban system]. We've talked about a system where you could pick and ban heroes, where you had to queue as a role to say, "I will play a tank." But there are these interesting times where you might start off a match with two support, two DPS, and two tank, but by the end you have one tank, one support, and four DPS and it was absolutely the right call to make those decisions. I really don't think we want that fluidity to go away. I have been thinking about--and this is purely brainstorming so we don't have anything in the works for this--how do we, in particular for competitive play, allow groups to form outside of the natural matchmaking, so somebody could say, "Hey, I'm just a support player and I'm going to play support this whole match" and we don't need a pick and ban system to force people into the right role, they can just tell everyone what they do. That would still allow there to be some fluidity where somebody could yell at me, "They're going to take the point, switch to D.Va to fly out there really fast or switch to Tracer to cap." The game wouldn't be preventing that from happening. Is there any truth to the story that Orisa's origin started with you rolling around on the floor at the Blizzard Christmas party pretending to be Junkrat's ultimate? I believe that was reported by YouTuber DinoFlask. I think that was [principal designer] Geoff Goodman. The two Jeffs often get confused so I'm almost certain that was Geoff Goodman. You recently talked about including a Map Editor in the future. Was that always on the cards or was it a response to the community now asking for it? We've always wanted one. The reason I clarified that is because sometimes the community perception of us and our design philosophies is a little bit skewed. I've seen this comment before like, "Oh Blizzard would never add a map editor because they don't want anybody touching their stuff." That was kind of shocking to me because Warcraft 3 and StarCraft 2 have some of the greatest editors of all time. The whole DotA genre wouldn't exist if it weren't for that. World of Warcraft also had the amazing interface which we supported. It was more getting a statement out there to say, philosophically, we're totally on board with things like a map editor. The problem is because we're a brand new engine, for us to get our tools in players' hands is literally going to take years. It's not even something I could say like, "Oh that's our top priority now and in the next couple patches you'll see it." It's literally years away, the amount of work it will take to get there someday. But philosophically, the team is super excited to someday get there. But it's not trivial. Both Zangief and Zarya have wrestled bears, but who would win in a contest between themselves? The community worked itself up into a bit of a frenzy around Doomfist but we got Orisa. Will Doomfist have his moment to shine in the future? I am actually fascinated by Doomfist in the sense that … We know when we talked about Sombra we did some things incorrectly. We got people excited too early and in the wrong ways, and we've tried to express our sincere apologies to the community on how we handled the Sombra situation. But Doomfist we've literally not hyped at all. The community has just decided to get themselves excited for Doomfist. Obviously, from the very first announcement cinematic, Doomfist was a character in our world. We've learned more about him now with Orisa. But we'll leave it at that for now. The community will continue to ramp itself up over this character though. Thank you. Have you noticed how you elongate "team"? Yeah, I've watched that video hundreds of times. I think about DinoFlask often. I'm sure DinoFlask would be very happy to know that. Yeah, well, he's this individual … he and I have spent a lot of time together, but we don't know each other at all. He must look at me as some weird science experiment at this point. He must know quirks about me that my own mother and wife don't know. Yeah. His Twitter bio is "I make a grown man say funny things." What's the deal with your beard? You look so badass when it's grown out but you keep shaving it. My wife doesn't like it. But I'm here [in London] for a week so I can do whatever I want. Who is your favourite member of the Fast and Furious family? I've never seen a Fast and Furious film. Yeah. I have not seen a single movie in that series. [To PR] How have you allowed this to happen? PR: I haven't seen any either. PR: I don't know how this has happened. You should watch them because they are both awful and spectacular. Okay I love movies like that. Not yet but I'm dying to see it. Aaron Keller, our assistant game director, saw it and he said it was fantastic. It was made by [Jordan] Peele from Key & Peele right? Yeah! And they're reportedly being lined up for the live-action Akira project. Wow that's cool. I'm lagging months behind on movies. I watched Rogue One on the flight over here. I thought it was fantastic. I want to see it on a big screen again. I was so excited by it. Do you have any plans to make Loot Boxes great again? Yes. We have some amazing Loot Box content coming up. I'll just leave it at that. Do they have any Zarya costumes because she's my girl and for the last few events she's been a bit left out. I will tell you this, for Zarya in particular the next event won't have anything and I apologise. BUT! Shortly after that there will an amazing Zarya skin. So are ARG character reveals completely out of the question now or what? The ARG was a big experiment for us. What's funny is we had talked about doing an ARG for the announcement of Overwatch itself since we have a lot of people that are passionate about ARGs at Blizzard. When we were starting the ARG to announce the game, I was somebody who wanted to steer away from it because, as a game designer, I was thinking, "I know how hard it is to design a game and a lot of people who aren't game designers think it's easy and want to do it." I was thinking to myself an ARG requires the same level of design expertise that a game would, but we don't have that. It wasn't an area where we were comfortable, so we steered away from it. With Sombra, because she's a hacker, it was fun to put these hints of things around. But I think the hints got away from us. I don't think we have any plans to do another ARG. Have you ever thought about making a cat hero? Surely the Internet would love that. The answer is yes. This is an exclusive, no one has ever heard this before, but when we were first starting to make Overwatch we had to test the boundaries. It was a new IP and we didn't know how far or wide we could go, so Winston was kind of this cornerstone in a lot of ways. It was like, "Hey there's a gorilla and he talks, is that okay? Yeah, that's okay." Then on the other end of the spectrum you've got guys like Soldier 76 who is a soldier guy and they were good bookends. But we had explored much further out from that. We had done a lot of concepting. We had one hero who was just a hockey player. Literally a hockey player. We later made a Lucio skin for a hockey player. But he was just a hockey player hero. Then there was this one hero that was a huge internal debate on the team because we just loved it so much but it didn't make it. It was this jetpack and it had this cat that laid in it, like a cat does. Then every once in awhile it would paw at the controls. It was a cat in a jetpack. That was one of those moments that helped define Overwatch. We just went, "Yeah that's probably too far." But yes. We had a cat hero. That sounds incredible and you should bring it back. I just can't imagine it from first-person, seeing those little cat paws because--do you have a cat? Yes I have two cats named Kiki. My cats have activated my ultimate accidentally multiple times. [Laughs] Of course. Why not? Have you thought about introducing context based voice lines or lines that help people coordinate ultimate timings better when they're not on mic? I think we have an opportunity … when we added the customizable spray wheel and the emotes we talked about letting you do more voice line customisation. But what tends to happen is players ask, "I want this line, this line, this line" and then add them all to the wheel to where we have 36 little pie slices on the wheel. What I think what would be a better system is if we gave you some customisation on those pieces of the pie, then you could unlock all these voice lines and decide as a player what you want to slot in. We have the system where you hit Z which sends an Ult alert by default, if another player targets the character using that line and hits F it will acknowledge that you know the ultimate is ready. It's a little bit buried in there but that system is kind of there. Our thought was that's how you would coordinate with somebody. Do you know what Sombra says when she activates her ultimate? The first time we heard it, it sounded like "scandalous uses" and now that's all we hear and shout. I haven't taken Spanish in about 20 years but I think it's, "apagando las luces," and I think it means something about turning off the lights. Pretty sure it's "scandalous uses," Jeff. She had a different ultimate line and it sounded amazing. It was something like, "Here we go into the midnight" and it contrasted with McCree a lot, because he was talking about High Noon. Are you aware that if you Google your name this is the first picture that shows up? If you read So You've been Publicly Shamed by Jon Ronson he meets people that specialise in burying unwanted search engine results. Might be useful. People who get to know me know how easy going I am. As somebody who literally grew up on the internet, like I was there the day we all started being gamers on the internet, I think you have to roll with the punches. There's no way I'm going to manipulate my Google Image search results because there's probably someone out there who will manipulate it back. Somebody probably manipulated it to be that in the first place. Definitely. It's a very specific snapshot from a developer update. You know when you're in school as a young teenager and you have all the insecurities? This is the kind of thing you have nightmares about. Like, "Oh, what if that picture ends up on the Internet." But I'm old enough now that I'm over it.